Greenwich’s Evan Weigold blocks the punt of Trinity kicker Sam Pensiero during the second quarter on Saturday. GREENWICH — Greenwich’s offense couldn’t be stopped and its defense barely budged during the first half of Saturday’s football game against Trinity Catholic. And that, of course, made it a long first half for the Crusaders. Scoring on six of its seven opening-half possessions, while shutting down the opposition’s offense, Greenwich coasted to a resounding 56-0 victory over Trinity Catholic in an FCIAC game held at Cardinal Stadium. Senior Tysen Comizio ran for two touchdowns during the first half of play, as did junior running back Jack Warren for the 2-0 Cardinals. Sophomore A.J. Barber, the son of New York Giants former star running back Tiki Barber, caught a touchdown pass from senior quarterback Gavin Muir and senior Stephen Bennett hauled in a Muir scoring strike for Greenwich, which led 49-0 at halftime. 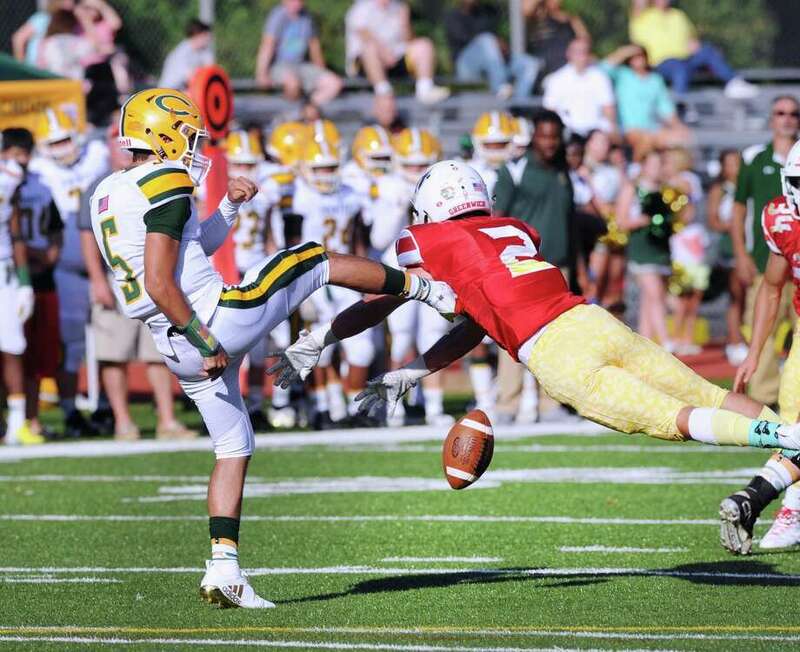 Greenwich, which was whistled for 21 penalties in last week’s season-opener against Trumbull, only committed a handful of infractions Saturday. Senior defensive end Emilio Camou returned an interception for a score for the victors, who limited the Crusaders to only one first down in the opening half. The Cardinals’ first touchdown came on its second possession. Senior wide receiver Ryan Raybuck caught a 46-yard pass from Muir giving the home team the ball at the Crusaders’ 1-yard line. On the ensuing play, Muir pitched a shovel pass to Barber, who ran it into the end zone from 1-yard out. Ben Howarth split the uprights on the point after attempt and GHS had a 7-0 lead with 5:35 remaining in the first quarter. The touchdown was the fourth in two games for Barber, who reached the end zone three times in Greenwich’s 42-7 Week 1 win over Trumbull. Trinity Catholic (0-2) rotated senior Sam Pensiero and Matthew Dougherty at quarterback, but couldn’t find its rhythm offensively against the Cardinals’ stout and stingy defense. Following a Trinity three-and-out, Greenwich extended its advantage when Comizio took Muir’s handoff and bulled his way up the middle for a 4-yard touchdown run with 3:52 to go in the second quarter. Comizio set up his own score with a 55-yard run on the prior play. In the right place at the right time, Cardinals senior defensive end put points on the scoreboard for the home team. Camou intercepted Dougherty’s pass and sprinted 29 yards for a touchdown, making it 21-0. Feda added two rushing touchdowns, Comizio ran it into the end zone and Bennett caught a 5-yard scoring strike from Muir to cap Greenwich’s first-half scoring. Hugo Mark caught a 20-yard pass for a score from sophomore Cage Lasley for GHS, which played five quarterbacks for the game. Trinity played Dougherty and Pensiero at quarterback throughout. The offense featured running back Michael Barrett. The Crusaders picked up only three first downs for the game. Greenwich’s offensive line of Jack McBreairty, Nolan Connerty, Callum Abnerthy, Tyler Dietrich and Jacob Belmont protected Muir throughout and helped spark the running game. On the other side of the ball, Greenwich’s defensive line, like Week 1 pressured the quarterback. That was like watching varsity vs JV in the first half. Sad to see what Trinity has become versus what they were as recently as 2016, when they went 6-4 (and in 2015 they only lost one regular season game…to Greenwich…by one score!). Hope TC can get their legs back under them, and hope Greenwich can continue to progress as their date with New Canaan gets closer and closer. Sidenote: Mozi Bici had one of his arms in a sling on the sidelines today. Anyone know what happened? Hoping for a speedy recovery! Like I stated in another post why schedule this game ? The majority of the Leagues in this state schedule games like this to get teams in Post season. Trinity is in Greenwich’s division (FCIAC-West), so that’s why they play each other. Junior Marinelli fishing for #1 votes. Panapada had a closer than front row seat, so he’s the first to bite the hook. The Catholic school’s are all down, St Joe’s being the only one that people can say is a real power house. I believe and it’s only my opinion’ that prep school’s are hurting the Catholic school’s because the prep factor no CIAC rule’s ect. is more attractive and coaching is huge. The other thing is the fact is that kid’s can do a year over and play another year of high school football and get there grade’s better When people say there need’s to be a Catholic league there right but NOT because there all great but because they aren’t good and RECENT GREENWICH GRAD is right it’s like varsity vs JV i witnessed it myself with Holy cross and Ansonia. Going back to the year 2000, Catholic schools won 13% of the state titles. Catholic schools have 11% of the teams in Ct HS football in 2017. If you run the stats on public schools you will see similar numbers – that is – a concentration of the championships won by relatively few schools. I think >70% of the titles were won by about 10 schools. Thus, while this may be a “down year”, we will have to see. If St Joes continues to dominate, and wins a title, that means a Catholic school will have won 25% of the titles this year. On point, regarding the Catholic schools. Prep and SJ trending upward; X and TC going backwards. Interesting to see impact of Prep schools , not only on the Catholics,but also on the city programs, which in this area (Stamford, Bridgeport) are now afterthoughts. Prep has not won a state championship since 1988. Since 2000 the four Catholic schools to win state titles are St. Joseph-5, Xavier-5, NDWH-2, Holy Cross-2. Maybe time to realign divisions so as you say no more “Varsity vs JV” games ?? Maybe also all leagues the OPTION of 1-3 Out of Conference Competitive Match Ups ?? With no more FCIAC title game, there’s literally no point of having divisions.